Some of you reading this would remember me from my old blog ‘My Warhammer Fantasy Blog’. When my war gaming changed from only Warhamer Fantasy I decided to create a new blog to reflect the changes in my hobby. Hence I created this new blog on WordPress. My son Tyler wanted to get back into war gaming so instead of purchasing and painting another Warhammer Fantasy army we opted for Warmachine after a demo at Maelstrom Games. I am a Protectorate of Menoth player and Tyler a Khador and recently Mercenaries. At the moment Warmachine is all we play, and it the main talking points of the blog. At the moment I can’t see myself wanting to seriously play any other game in the near future. What with playing Warmachine a lot for the past two years, I would like to start a Hordes faction. At the moment I cannot decide on which faction I want to paint and play. 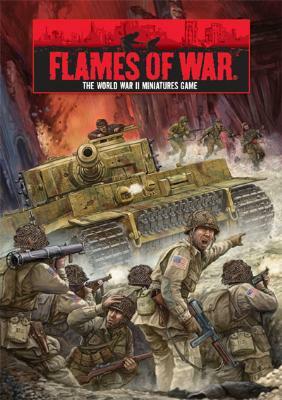 At the end of 2010 I finally decided to start a new gaming system and its Flames of War. It was a choice between this game and Napoleonics, but I opted for World War Two. I have purchased the Open Fire box set over Christmas, for the mini rule book. Plus started an American 101st Airbourne army, which is strongly influenced by the TV series Band of Brothers. My first purchases were the Platoon Rifle Company, the dice and tokens for the 101st Airbourne, along with the book Hells Highway. This is going to be a back burner project at the moment, so not expecting to get any meaningful size games in until well into the 2013. I will also be starting a German Fallschirmjäger army as well, so thats two Paratrooper armies! My name is Mark Evans. I live in Warwickshire, England. I have been collecting and painting Citadel miniatures since early 2007. My son Tyler got me interested in Warhammer Fantasy one Christmas when he had the Battle for Skull Pass as a present. I am the bolding gentleman in the white polo shirt pondering on my next move with my Ogre Kingdoms. The picture was taken at Maelstrom Games during the first round of the Summer Incursion tournament in 2010. I have previously owned two Warhammer Fantasy armies, Warriors of Chaos and Ogre Kingdoms. Warriors of Chaos around 2,250 points and Ogre Kingdoms around 2,900 points. I am now building a Warmachine Protectorate of Menoth army.Over the past years I have also painted the Lord of the Rings Mines of Moria box set, and a Warhammer 40K Catachan Imperial Guard army. Alas I have sold both of these to fund my new projects. This Warriors of Chaos Exalted Champion was the very first Citadel miniature that I painted. It was back in 2007 and the start of my Warriors of Chaos army. The army has been expanded to around 2,250 points over the years. Over the years Games Workshop has messed around the Warriors of Chaos player. Removing Daemons from the Hordes of Chaos and putting Daemons into another army book. This is the reason for me starting another army. The Ogre Kingdoms was my second and most loved Warhammer Fantasy army. I really enjoy the play style of the army and the miniatures are great to paint. It was this army that I started taking to tournaments, and I found a love for the game. However I have been waiting on Games Workshop to release a newer army book and miniatures for far too long. I don’t want to purchase and start painting more miniatures for this army, only to find Games Workshop release newer miniatures a couple of months later. I can’t ever see myself playing Warhammer Fantasy ever again. The release of the 8th edition rules, and painting tonnes of miniatures for an army quiet frankly does not move me anymore.